Justice: the preserve of the rich? “Legal aid payouts to fat cat lawyers will be slashed by a third.” “End to compensation culture.” “Taxpayers’ money used to fund human rights claims by prisoners.” Judging from the headlines, you could be forgiven for believing that legal aid is an elaborate hoax where lawyers and criminals work together to steal the taxpayer’s hard earned cash. This just isn’t true. Legal aid ensures that being poor is not a barrier to justice and gives a voice to vulnerable people in society. However, the government is determined to enact devastating cuts to legal aid, transforming justice from a basic right into a luxury for the rich. On April 1st 2013, the government slashed legal aid in family, employment, immigration and clinical negligence cases. If you are getting divorced and fighting for custody of your children, you won’t have access to a solicitor unless you’re lucky enough to be able to afford one. This will have a disproportionate impact on women, who are more likely to be financially dependent on the partner they’re divorcing, and so won’t be able to afford a solicitor. Forcing couples to have a DIY divorce even in custody cases will have a harrowing effect on children as a poorer parent is left unable to fight for custody. Legal aid will remain for cases involving domestic violence, but you’ll have to show proof of domestic violence in the last two years, and there’s no legal aid to help you collect this evidence. Given the difficulties that victims of domestic violence face in speaking out, many won’t have concrete evidence of their abuse. At the same time, the government removed legal aid for clinical negligence claims, with an exception for cases where the injury had been suffered by a foetus, during birth or within the first eight weeks of a child’s life. Clinical negligence cases are often used as examples of our ‘compensation culture’ due to the large sums of money that are awarded and the fact that the NHS is often footing the bill. However, it’s important to understand that the amounts awarded in these cases aren’t just ‘payouts’, and that they reflect more than the injury alone. Claimants may have suffered serious permanent injuries that require around-the-clock care and serious adaptations to their home. The lack of legal aid makes it difficult for poorer people to bring claims at all, but also makes it harder for those who are able to bring claims to succeed. Legal aid clinical negligence work was carried out by specialist law firms who were equipped to tackle the inevitable complexities of these cases. Approaching your local high street solicitor is unlikely to achieve the same results. The cuts in April also affected employment law and immigration law, but the government hasn’t stopped there. The Justice Secretary Chris Grayling plans to introduce a residence requirement, meaning that individuals would need to be lawfully resident in the UK for at least 12 months before becoming eligible for legal aid. He wants to reduce the scope of legal aid for prison law, forcing prisoners to rely solely upon an internal complaints system or an ombudsman that can only make ‘recommendations’. Prisoners being mistreated would have no legal recourse unless they were able to afford to pay for their own representation – something that few prisoners are able to do. Most damaging of all are the plans to introduce PCT – price-competitive tendering – for criminal legal aid. The government plans to contract out criminal legal aid work to firms, awarding the contract to the lowest bidder. Don’t believe that PCT will affect the quality of legal work? Just look at court interpreters – the government introduced PCT for them in early 2012, which has led to a chaotic system where interpreters have shown up at the wrong time or simply not shown up at all. Under PCT, defendants would no longer have any choice over their solicitor. Chris Grayling tells us that those accused of a crime are too stupid to have any say in their legal representation. In a recent interview with the Law Society Gazette, he claimed “I don’t believe that most people who find themselves in our criminal justice system are great connoisseurs of legal skills.” While the average person may not be familiar with the intricacies of the law, they are perfectly capable of deciding whether or not they trust their solicitor enough to confide in them. If you’re horrified at the government’s plans to dismantle our justice system, you are not alone. A recent Bar Council poll shows that 71% of the British public are concerned that the legal aid cuts could lead to innocent people being convicted, and 67% agree that legal aid is a worthwhile investment for a fair society. However, we need to make our feelings clear to Parliament. Contact your local MP and make it clear that you oppose these plans, and demand that they do the same. Sign the petition to Save UK Justice. Reply to the government’s Consultation on Legal Aid – it’s open until Tuesday 4th June. Our justice system should not operate exclusively for the benefit of the rich and the powerful – it should be accessible to those who need it most. 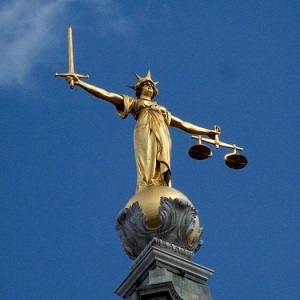 Photo of gold statue holding the scales of justice by Michael Grimes, shared under a Creative Commons licence.